Port Newark Container Terminal is the junction where containers are loaded onto and off the ships that berth, and the trucks that carry these containers, serving the rest of the country. There are rows of cranes along the docks where the ships berth — and these cranes need to be constructed on site. After construction, these massive cranes need to be moved into position at the berth. 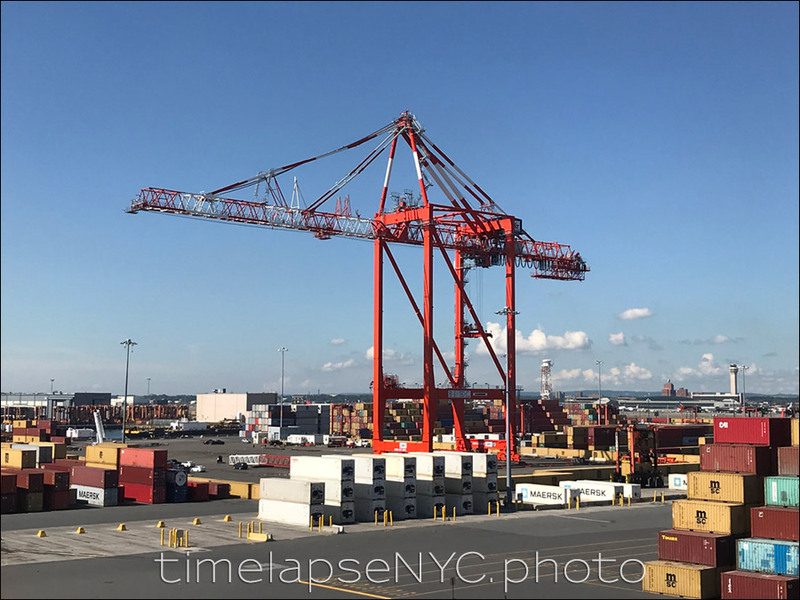 This time-lapse encompasses the 4 hours that it takes to move a crane from the construction area, all the way to berth … with all this condensed into a 1’30” video. That again is the forte of time-lapse photography – giving a better view of gradual activity so that we can get sense of what is happening in front of our eyes. This crane moved so slowly in real time, that you could barely see it move. Only personnel involved with the project would have noticed the movement. Any passerby would not have known the crane was actually moving! This activity is only is revealed through the time-lapse video. Midway through the video, you can see a row of cranes move to the right – I didn’t realize these cranes had moved until I finally generated this video. For this time-lapse, I used 4 cameras on tripods to capture the crane moving by from the construction area to the final place. Each camera captured a different angle, or a different section of the path the crane took. Below is a time-lapse video showing another construction project on site at PNCT. In this case, how a straddle carrier is built up. The straddle carrier will carry 3 containers at a time. Again, this is an event that would be too slow for video, but time-lapse shows the activity in a compressed time-frame and is a better way to depict the activity.